Upon arriving in the charming 12th century village of Poboleda, in the middle of Priorat, the exact direction you need to go in order to get to Mas Sinén (where Celler Burgos Porta is located) isn’t immediately obvious. A quick drop down Carrer Major though will bring you to the first of many signs that guide you through the village and out the other side, winding your way through the hills and many terraced vineyards of others who make their wine in Poboleda. As the road continues, it’s easy to think that perhaps upon arrival, a wild boar in the area will show up to valet park your car at the winery. But, long before you reach Porrera (as this was the old donkey road that used to connect the two villages), the bowl of slate terraces that wrap around the stone winery of Mas Sinén open before you. Here Salvador Burgos and Conxita Porta have been growing their vines organically since the 1980s, although they have a long viticulture tradition in the family linked to the local cooperative. These days they have 14 hectares of vineyards ranging from 300 to 500m of altitude, distributed between this little valley and another nearby mountain slope. 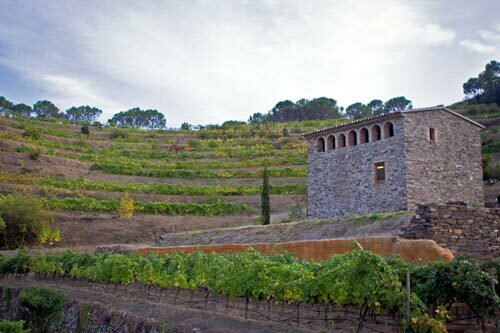 While the winery building is a lovely stone structure, it’s actually quite modern given that the 300 year-old masia that was on the property was essentially abandoned when they started the winery in 2003. That first vintage, which they produced in another winery, was of only 2,000 bottles. Since then they’ve been slowly growing to the 20,000 bottles they’re hoping to produce this year, although their goal is to make a maximum amount of 25,000. 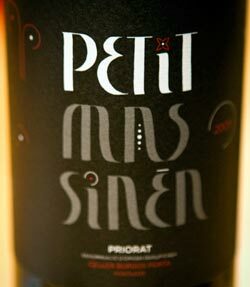 Their wines certainly reflect their character, but they also consult with enolog Toni Coca who advises a number of wineries in Priorat with great results. Salvador and Conxita happily take visitors on a tour of the steep terraces and the winery with a tasting afterwards of their three main wines for 10€. They love to show them the gorgeous views of the surrounding mountains, give them a taste of water from the ancient fountain set on top of the vineyards (quite a rare thing in the dry soils of Priorat), some figs from their trees when they’re in season, and even let them enjoy a picnic in the area they have for that. It’s a visit that everyone in the area recommends.